You can order your fish ahead from the Fish Service Counter. Heat the oil in a large pan and cook the onions and red pepper for 10 minutes until soft. Add the garlic and cook for 1 minute, then add the tomatoes. Cook for 5 minutes until they are soft and pulpy. Add the wine, saffron, bacon, bay leaves and fennel seeds. Bring to the boil and simmer gently for 5 minutes then season with salt and freshly ground pepper. Cover and set aside. 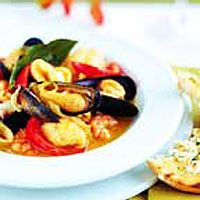 When you are ready to serve, gently reheat the sauce and, when simmering, add the mussels and shell-on prawns. Cover and cook for 3 minutes. Add the peeled prawns, white fish and squid, cover and cook for a further 5-6 minutes until the fish is just cooked. Discard any mussels that have not opened and serve immediately. When cleaning mussels, discard any with broken shells or with shells that don't close when given a firm tap.